Ponta Delgada is the capital of the Azores archipelago as well as the capital of its largest island, São Miguel. 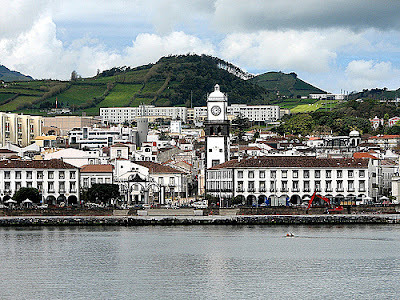 Ponta Delgada is a flat town situated on the south coast of São Miguel and lies in a wide bay between green hills. The city is considered the tourist heart of Azores with a population of over 65,000. It is used by many as a base for exploring Sao Miguel and Azores’ other islands. But Ponta Delgada itself has a lot to offer – its magnificent renaissance architecture, its rich museums, the nearby natural attractions, and the city’s vibrant festivities and nightlife. Ponta Delgada began as a fishing village. Its safe inlets and great location on the south coast turned it into the main port of Sao Miguel in the 16th century. After suffering attacks in the 16th and 17th centuries, Pont Delgada experienced economic prosperity during the 18th and 19th centuries, which led to the construction of grand palaces, churches, mansions, and monuments that now adorn the city’s skyline. 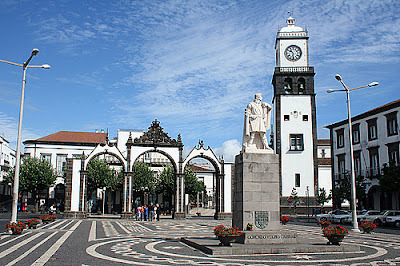 In 1861, Ponta Delgada began building an artificial port, which further cemented the city’s status as the main port and economic and administrative center of the Azores. The airport lies on the western edge of the city, from which there are daily flights to the other islands and mainland Portugal, and frequent direct flights to other European cities and North America. Ponta Delgada is a great place to start out your travels in and around the Azores. It is possible to make day tours from the city to volcanic crater lakes and thermal springs in the central regions of the island. The Caldeiras of Sete Cidades, an extinct volcano with two adjoining crater lakes, is just a short drive northwest of the city. The thermal springs, health baths, and spa resorts of Furnas Valley are to the city’s east and within driving distance. 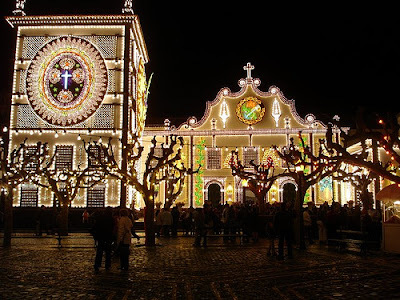 Ponta Delgada itself, however, boasts an impressive array of architectural riches: from churches, mansions, palaces, and convents, to various statues and monuments. The city welcomes you with the “Portas da Cidade” gates, constructed in the form of three arches. The three churches, St. Sebastian’s (São Sebastião), St. Joseph’s (São José), St. Peter’s (São Pedro) are marvels, each representing a different architectural era. The St. Sebastian’s was completed in 1547 and is gothic in structure, Manueline in exterior, and adorned in the interior with gold thread embroideries and rare Brazilian wood. The St. Joseph’s was completed in 1709 and is more hispano-mexican, built using Jacarandá wood and decorated with religious statues and sculptures in baroque style. The St. Peter’s is more an 18th century church but the famous painting of “Pentecostes” by Pedro Carvalho is found at this church. Besides churches, there are palaces like the Fonte Bela, Sant’Ana and the Santa Catarina (residence of the Governor during the 18th century), and government buildings like the “Paços do Concelho” City Hall. The Convent and Chapel of Our Lady of Hope, “Nossa Senhora de Esperança” generally known as “Convento de Esperança” or simply Saint Christ’s Church “Igreja do Santo Cristo”, is home to the magnificent statue of “Senhor Santo Cristo dos Milagres” Christ of Miracles, the patron of the largest religious festival place in the Azores. There are many other buildings throughout the city which portray the urban architecture from the 17th to the 19th centuries. Wandering through the streets to discovering both the curious and the beautiful is a favourite pastime of all visitors. One of the important business centres is located on the Avenida Marginal, the avenue which follows the coastline of Ponta Delgada. The entrance to the Port where all the maritime traffic docks on the island is located at the extreme west end of the avenue. During the day traffic along the avenue is constant and on hot summer nights it becomes a popular meeting place. Located north of Ponta Delgada are the suburbs of Fajã de Baixo and Fajã de Cima. Fajã de Baixo is agricultural with pineapple cultivation. Fajã de Cima is famous for its festivities. To the eastern side of Ponta Delgada is the suburb of "São Roque" which is gradually becoming part of the city itself as it expands along the coast with the construction of a new marina and a seaside walk with leisure facilities. 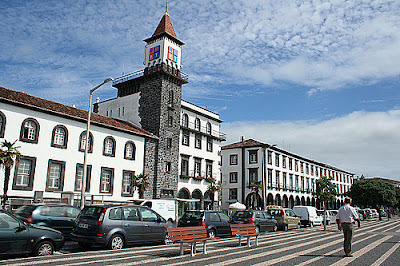 Ponta Delgada also has a university, the Universidade dos Açores (University of Azores), as well as schools, lyceums, gymnasia, banks, post offices, sporting facilities, three major soccer teams and several public squares (praças).